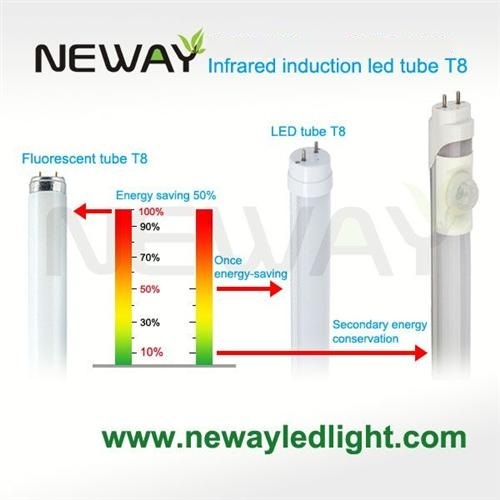 LED T8 tube lighting saves energy by being more efficient than the fluorescent tube lights that it replaces. However, in places where there is low people-traffic and a requirement to be constantly illuminated, even greater energy savings can be achieved through the use of sensor tube lighting. The inclusion of an infrared sensor means that the light dims when there's no movement in a room. Whilst movement is detected the light will switch to maximum brightness. Sensor LED tube lights use less power when dimmed which contributes to your energy savings. This makes it perfect for car parks, underground tunnels or passage-ways and other areas with intermittent people traffic. Standard pir sensor led t8 tube power 9w with 48 leds smd2835, 12w with 60 leds smd2835, 18w with 96 leds smd2835, 24w with 140 leds smd2835, custom other wattages; standard length 600mm, 900mm, 1200mm, 1500mm, custom other length. 1.Dynamic movement lighting mode: When the persons or vehicles moving, induction straight line distance of 6-8 meters, a height of 3-4 m suspended high hanging sensing area is eight meters in diameter, intelligent infrared sensing angle of 140 degrees control area. signal in the sleep led t8 tube light will wake up automatically, people walking with owners parking, vehicles or people in the induction of the activities in the Area , the induction lamp will always maintain full brightness. * Power consumption can be adjusted to completely shut down, after full brightness, then full turn off. * Power consumption can be adjusted to different micro-light sleep standby power. For example: 1W, 2W, 4W, 5W until full brightness. * Between static and dynamic lighting mode, when persosn or cars leave the induction areas after 30 seconds (lighting delay time), infrared sensor led t8 tube lights automatically re-entered sleep mode, only need power 3W. Note: To avoid potentially damaging short circuit, wire as per the diagram left. Note: Bypassing/removing the magnetic ballast and capacitor will increase energy savings and assist with power factor. Starter must be changed to LED fuse starter. Note: The electronic ballast must be removed or bypassed. Government organizations building lighting project, the factory lighting engineering, school energy-saving lighting engineering, underground parking garage, underground parking lighting engineering and expansion, the airport energy-saving lighting transformation, hotel lighting transformation, hospital lighting energy saving reconstruction, marketplace lighting engineering modification should be long hours every day or 24 hours lighting of large lighting energy saving place. PIR sensor led t8 tube light application in car parking lot lighting, parking lot lighting, underground parking garage lighting, corridor lighting, passageway lighting, warehouse lighting, hallway lighting, 24 hours lighting place, hotel lighting, hospital lighting, subway lighting, metro stations lighting, office lighting, residential building lighting, home lighting, library lighting, casino lighting, gallery lighting. PIR Motion Sensor LED Bulb, Dimmable LED Bulb Light, Wide Beam Angle LED Bulb, Candle LED Light Bulb, LED Linear Suspension Pendant Lighting, COB LED Module, Low Temperature LED Module, Waterproof LED Module, Waterproof LED Tube, PIR Infrared Human Sensor LED Tube, T8, T5 LED Tube Light, Rechargeable Portable LED Tube, 2G7, 2G11 LED Tube, PIR Touch Switch Dimmable Linear LED Light Bar, LED Cabinet Rigid Strip Light, Ceiling Mount LED, LED Under Cabinet Lighting, MR16, GU10 LED Spotlight, LED PAR20, PAR30, PAR38, AR111 Light, Recessed or PLC LED Ceiling Down Light, Dimmable Flat LED Panel Light, Waterproof Flat LED Panel Light, Square, Rectangle LED Panel Light, Blister Package High Voltage LED Strip Lighting Kit, Blister Packing 5M LED Strip Light, and Motion Sensor LED Flood Light etc.